The most innovative companies in the world have modern internal communications strategies that transform their businesses. They save millions on the costs of employee turnover, increase profitability, and consistently attract and employ top talent. Hearing this phrase from a member of your team triggers many emotions. If you are the person they are telling, then you are likely the person who needs to begin the process of posting the job (or retaining a recruiter), reviewing resumes, onboarding your new hire, and getting them up to speed. It also means the time, energy and money you put into the team member who is leaving is now lost. You may not have considered what this all costs your business in a year. We have, and the costs are staggering. We will show you what it is costing you in a minute. There is an even large issue to these departures. They are a flashing red sign of a lack of employee engagement that slowly eats away at teams and the whole organization. While engagement may feel like a soft concept, it has a significant financial impact. In fact, numerous studies have shown that companies with increased employee engagement are up to 22% more profitable. Yes, 22%!! Finally, in today’s business world where companies with the best people win, our work creates organizations that become magnets for the very best talent. And those companies with the best talent dominate their industries. We are in the business of internal communications to help businesses decrease employee turnover, increase profitability, and have the very best talent coming to them. We know, talk is cheap! So, let’s make this very real for your business, right now. How Much Is This Costing Your Company? To calculate how much employee turnover is costing you and the revenue that can be created by increased employee engagement, simply complete the below based on your company. What is their average salary? What is your rate of attrition? What does it cost to find new talent? How long does it take to ramp up a new hire? What is your projected revenue for 2019? Empower your people with the information they need to do their jobs, learn and grow. Drive innovation and collaboration by giving people a say and building connections. Increase commitment and motivation with a clear and meaningful purpose. Our process is clear and simple. This is what makes it so powerful. We’ll show you exactly how it works. Exceptional organizations and powerful brands understand that their people are the true source of their competitive advantage. Supporting the well-being of people and helping them flourish is not just good for business, it is the right thing to do. 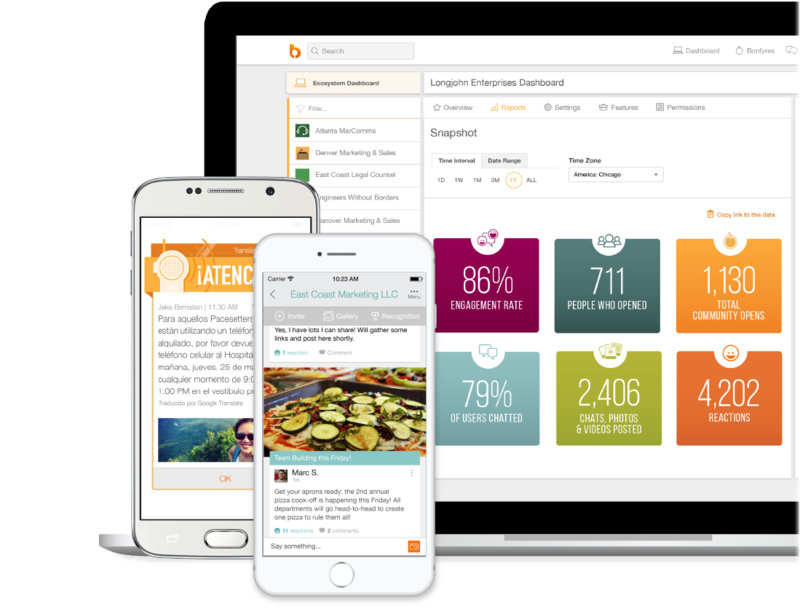 We’ve teamed up with Bonfyre to bring modern, mobile-first technology to more efficiently build your culture and give every person across your organization a voice. Book your free 30-minute strategy session today. We’ll show you how we get everyone in your company rowing in the same direction to create an unstoppable organization. How to uncover the true causes of employee turnover. One breakthrough strategy for you to put into action immediately. Show you the things companies with highly engaged workers always do. Show you how to get your large company all rowing in the same direction. Leverage the latest technology to give everyone a voice and measure your progress. DOWNLOAD our eBook today to increase employee engagement. You’ll also join our mailing list and receive the strategies we share with our private clients. Internal communications for the most successful organizations.